Chrono Trigger is one the most highly revered RPGs from the SNES era. Despite its praise, there have been many debates about the strength of the game’s characters. On the surface, they seem like a bunch of of standard character tropes thrown together. However, after taking a closer look, they are a lot more complex than first imagined. We’ve already covered Frog, so today, I’m going to focus on one my all-time favorite characters, Lucca. Continue reading at your own risk, as there will be spoilers ahead. The game starts out with the Kingdom of Guardia holding a carnival of sorts called the Millennial Fair, celebrating 1,000 years since the kingdom’s founding. It is here we first meet Lucca, a genius inventor type who is also the best friend to Crono, the game’s silent protagonist. 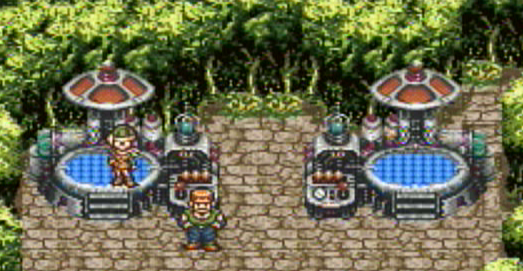 From talking to the other people at the fair, you get the sense that Lucca’s inventions have a tendency to fail, and that Crono is often the guinea pig. Her latest, a machine she calls a “telepod,” is unveiled at the fair. 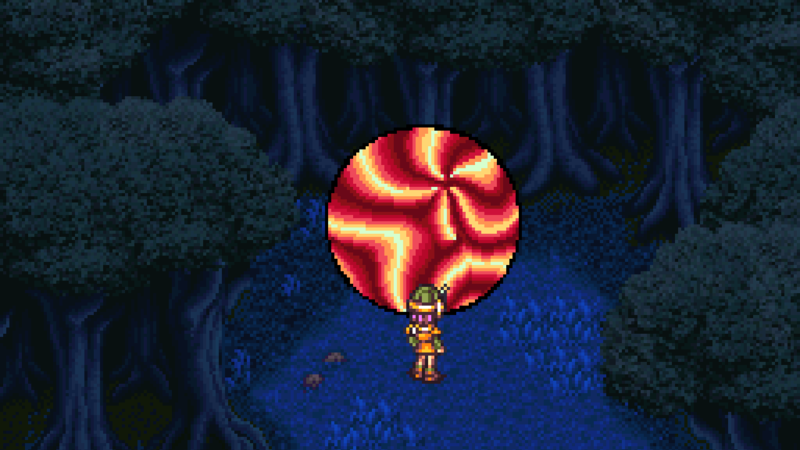 She suckers Crono into demonstrating it, and after one successful test, it malfunctions, setting up the entire adventure. Though Lucca’s relationship with Crono tends to take a backseat to the relationship between Crono and Marle, it is still fairly important. While firmly entrenched in the “childhood friend” role, there is not much evidence to suggest there’s any kind of love triangle going on. In fact, when she first sees Crono with Marle, she teases him about it, and later, once they learn the truth about Lavos and the 1999 apocalypse, she suggests that embarking on a quest to save the future would be a good way to impress her. Eventually, she and Marle become friends, permanently easing any possible tension that may have existed. 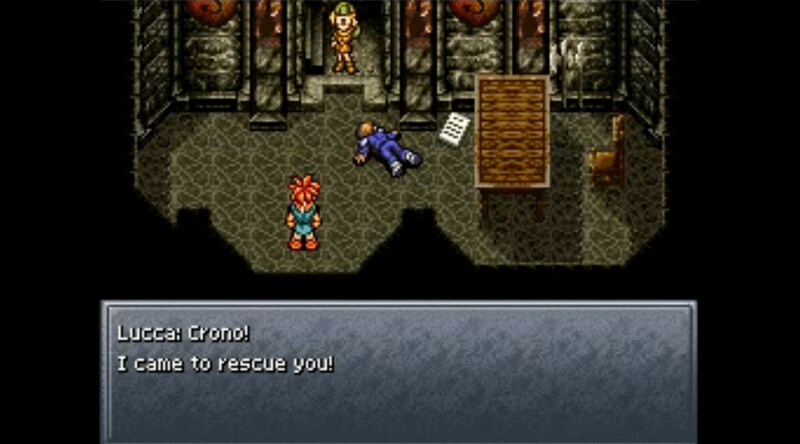 When Crono is endangered, it’s Lucca who comes to his rescue. Actually, she shows up to rescue Crono twice, once when he goes back in time to retrieve Marle at the beginning of the game, and later on when Crono is locked in the Castle dungeon and scheduled for execution by a fraudulent Chancellor. Being into technology and gadgets, it makes sense that Lucca will form the closest bonds with animated machines. Her relationship with Robo, a robot from the post-apocalyptic future, is one of the central parts of Lucca’s character. Her desire to build a fully-functional humanoid robot is practically fulfilled when she restores Robo’s circuitry and revives him. Despite Robo’s efforts toward a master/servant relationship, Lucca instantly befriends him and treats him like an equal member of the team. The empathy she expresses for the robots — both Robo and the others who attack them due to being slaves to their programming — lets us know she has a deep understanding of human nature and a great care for all living beings, even if she isn’t too adept at showing it. 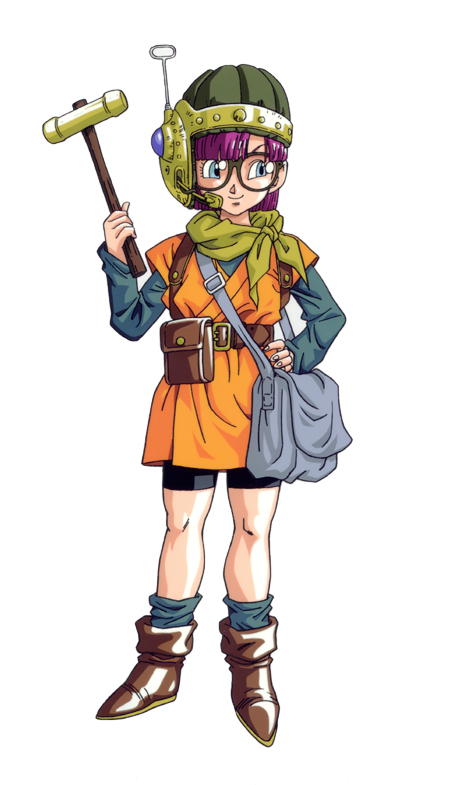 Lucca is hardly your stereotypical female character. She’s into science and engineering, and always wears a functional outfit, including shorts and a jacket that have tons of pockets, and tool belt to boot. Her main weapon of choice is a gun. She doesn’t hold back from having too much “soup” at a party. She’s strong, confident, and determined. However, there is a lot more to her than this admittedly basic character type. The problem is that most of Lucca’s personal growth happens in scenes that are completely optional to the player. It’s entirely possible to play through this game two, three, even ten times, and not once see just how deep of a character she is. Lucca has a fairly strong relationship with her family, namely her parents. She and her father, Taban, have bonded over a shared love of science and of inventing things. Her house is full technological gadgets and spare parts. Her mother, Lara, makes some disparaging remarks about machines, which may seem to indicate there’s a rift between them. Astute observers will notice Lara is always sitting down. This is because, years earlier, there was an accident. Lara’s dress got caught in one of Taban’s machines and she ended up paralyzed. As part of one of the optional sidequests later in the game, Lucca wakes in the middle of the night and enters a mysterious time gate which takes her to that fateful night ten years prior. Most players will go straight for the machine, enter the password and turn it off, rescuing Lucca’s mother from a cruel fate. However, should you fail to save Lara, the screen will fade out and you’ll see Lucca upstairs, in the bedroom of her younger self, crying on the bed after reliving a painful moment from her past. In a nearby diary entry, a young Lucca laments at not being more knowledgeable about machines. As a child, she hated science because it kept her father away from her, but it was because of her mother’s accident that she began her studies. In fact, if you succeed in rescuing Lara, that diary entry indicates her interest in science starts with the desire to prevent further accidents. After Crono’s death late in the game, the entire party is feeling dejected and defeated. The loss of their friend and leader has everyone feeling down, except for Marle, who is in complete denial and wants to go find where Crono disappeared to. Lucca is the one holding things together. She tries to console Marle without completely destroying her hope, all while trying to keep herself together. 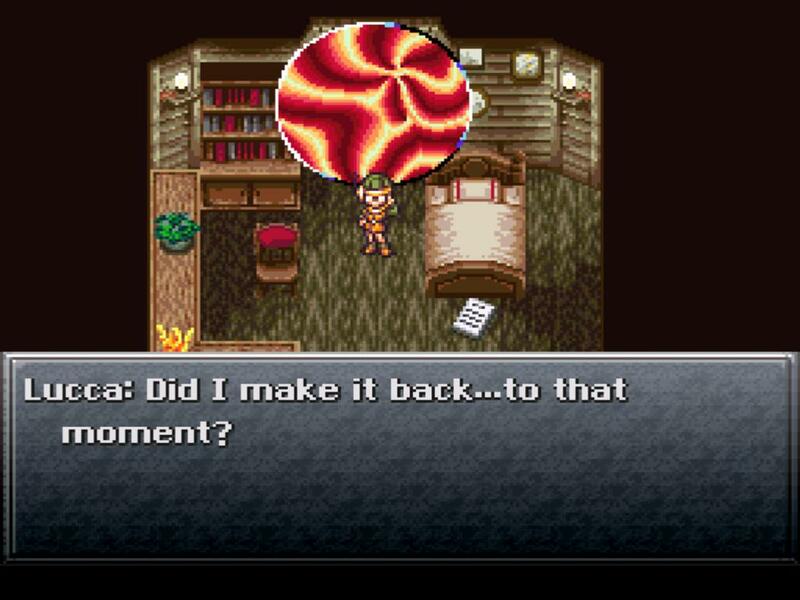 Bringing Marle along to ultimately revive Crono makes perfect sense considering their relationship. Lucca will stand there and watch the big romantic scene with Marle hugging him and telling him all that’s happened. However, should you decide to leave Marle behind, Lucca will be the one to have the emotional moment with her newly-revived friend. She hugs him and scolds him for dying on her, which seems to come from a place of genuine hurt. This is a rare instance where you see just how much she cares for him. While there’s nothing specific in the scene that indicates her feelings are romantic, it does show that her love for Crono goes much deeper than just being the same age and living next door to each other. While she may not be the most open about her feelings, Lucca’s love for her friends runs deep. That isn’t evident any more than during the game’s “true” ending. As everyone is saying goodbye before returning to their own time period, Lucca freezes when it’s time to bid farewell to Robo. This confuses Marle, who asks her what’s the matter. However, Robo already understands what’s bothering her. The party’s success at stopping Lavos has changed the future, and, since the future Robo came from no longer exists, it’s possible Robo doesn’t exist anymore, either. Lucca loses it and drops to her knees, crying. They share a tearful goodbye as Robo departs through the gate. Her intelligence betrays her as she can’t just say goodbye to her friend without worrying about what cruel fate may be in store for him. Finally, there was one more moment that showcased Lucca’s character depth. During the new anime cutscene added to the end of the PlayStation and 3DS versions of Chrono Trigger, she stumbles upon a baby that was apparently abandoned. She picks up the baby and takes it home to care for it. The game’s sequel, Chrono Cross, goes so far as to establish that not only did Lucca raise this child as her own, she opened her house to other abandoned children and started an orphanage where she raised many others. While we were only treated to brief glimpses of the warmth of her character, the love she has for her friends and the empathy she feels for others all flesh her out in a way no contrived plot twist ever could. She may have trouble outwardly expressing her emotions until she’s overwhelmed by them, and she may be more comfortable around machines than people, but that’s something many of us go through. Quite simply, Lucca seems like she could be a real person, and that’s what makes her so special.